Robotics not all that far away! I've welded for along time and lifted and carried to get metal ready to weld, so in my 60's I'm not all that spry or ready to tote a welding torch around all day. Not that my interest in welding or boat building has diminished its just the old carcass that seems a little reluctant to kick off a new project that means a decent day's work and the soreness that comes along. So I've been watching robots of all types for years, thinking that, like a PC, they'll come down in price and I'll get to buy one and ease my work load, not pay some young person who's too slow to read and is suffering other government school wounds to the mind- but still be able to build boats! That would be the ticket! If I could get robots to do my bidding, skip young people who aren't interested in listening to me tell them what to do, and still build boats??? well that would be near to a dream come true. So where are robots in the market progress to becoming affordable and readily available to do the jobs in our shops we want done? They're coming along fast. For those who don't know welding or 'work station' robots (not traveling but fixed base units) I'm going to give some glance at where they are and what they can do. IF you're not a robot inclined welded aluminum boat guy? you may want to move on and find more 'readable' posts? Most industrial robots began in the car making business where the cars on conveyor frames moved along the assembly line and the robot stood in one place and reached out to do a job, then the line moved and the robot did that job again on the next chassis that moved into its 'space'. That is still true for many models of robots. Those older robots required the conveyor and the part to be within about 0.003" (!!!) of the same place in space for the robots' program to reach to the welds in its program and weld in sequence. Now there are plenty with less tolerance but the weld robots typically required tight tolerances to work. The two limits were the (1.) position had to be exact so the fixtures had to be exact and the routine of the robot arm- had to be used over thousands or millions of welds' positions to pay back the high cost of the precise conveyor, fixtures, and robots' precise movements- and the high cost to program (2.) these "weld cells". That is like an old 'main frame' computer; it did lots of work but only if you could convert all problems to the way it worked. Now there are robots that can be programmed by 'teaching' the robot by pushing it to the location of a weld and telling it to 'remember to start a weld here' and the pushing the robot arm to the end of the weld and telling the robot 'remember to end the weld here' and then after showing/teaching/programming the robot arm- tell it to 'go' and it will repeat all that its been taught in robot speed and accuracy. This company is one of the pioneers in that method of teaching/programming a robot where to weld. The next change that is happening relates to the positioning of the robot in relationship to the fixtures. Remember this used to be 0.003" or very VERY close repeatable tolerances? Well not even inexpensive home plaz tables have various position sensors to detect the distance to the work for a plaz tip, and these are also now used on welding robots as well. What this does is make a fine tuning adjustment to any software instructions so the tolerance of the robot to work is now more like 1" or even 2"!! If the robot's arm gets within these much larger distances from the work areas the program can adjust for the differences between the original instructions and what is measured by the arms' sensors and adjust. Again a huge step in job shop or boat building welding related robotic related capabilities. Last but not least as far as cost; is the used robot rebuilding and refurbishing /factory rebuild part of the robot market place. Formerly all robots costs were sky high new and each generation trashed the previous models' capabilities. Well now there are quite a few manufacturers' refurbishing their own older robotic products as well as independent companies specializing in rebuilding and reselling welding and work cell robots. This is causing price reduction on some newer robots since they are not the only equipment that can do the work. The first two facts have not fully penetrated the last market segment to make these robots low cost and ready for job shop work. But... it took 20 years (1970's 1990's) for the PC to get to a market level that made them an everyday feature in everyone's home. I expect that welding robots will become lower cost and more available for the job shop (essentially the same as one off boat builders) in the next few years, and that their capability will become much more extensive. For example if a robot can move it arm with a 6' radius that is a 12' reach so why can't it do the work of a plaz or even router table? Another example if a robot had a quick change tool holder why can't it use the same teach to weld sequence to hold a wire wheel to buff the joint before welding, or back gouge before welding or do other tasks? (they can it's purely software at this point) then pick up the torch and weld where it has gouged and prepped? I'm not planning on using robots in my next build, but I do expect they may well affordably arrive in time to allow me to continue to build as I get older? just a note about the very interesting progress in this area of digital controls of machines. Re: Robotics not all that far away! The designers that generate cut files for the plate could also develop weld files for their boats . . . won't be long to where there won't be jobs for anybody! I think the robotic aspect will increase the availability and lower the cost of one-off welded boats by making key tasks faster reducing overall costs. So I think this technology will simply allow more to be made and that implies more builders and more jobs. I don't think the floor sweeping, clean-up skill level jobs will be increased- but I do think the lowered cost using robotic systems means there could be many more shops/builders building high quality for less cost. If a Pacific costs 2/3 what it does now, I'd say they'd sell more Pacific boats? But the higher level of effort of skilled labor makes that uneconomical. If the higher skilled workers can get more done in an hour with better tools, the price could come down while the quality stayed up. That is how I'm looking at this change in tools, just like using MIG instead of gas or stick, the tool improvement still needs someone who knows how the entire process works well enough to guide the process. Maybe eventually all humans will be eliminated but if car manufacturing is any indication; that's surely not for a while yet. Automation and robotics sophistication is reaching new levels that's for sure but in general the displacement of skilled workers with smart machines has been happening for quite awhile. I owned a machine shop from the early 70's thru the late 90's where we virtually came out of the industrial revolution types of lathes and mills into the rudimentary numerical controlled machines then on to the full blown CNC equipment. Early on everyone in the shop had to be an accomplished machinist. By the time I sold the company I had about the same number of employees but our production output had risen by a factor of 10, the quality of the product was way better and I had one very good machinist, a machine programmer and about 20 guys that just had to load parts into the machines and push a button. A relation of mine grew up in the PC board assy business that has gone through similar transitions from manual hand assembly of components on to boards to rudimentary pick and place robots to the point where everything is now residing on a big chip . . .
Its hard to imagine, however, that automation will ever be widely applied to the welding of one-off custom fabrications like an alloy boat. I mean there are so many decisions and evaluations that arise during that type of process that a machine will never be aware of . . . though I'm probably dead wrong. Then again, with 3-D printing of objects progressing as quickly as it is there may no longer be a need for any fabrication or welding in the near future. Just print out a boat and send it to the rigging department! (Big tin) apples to (little baby tin foil) oranges... but i wonder what robotics' effect to date has been on the big mass produced boat builders? Lunds and Starcrafts aren't getting any cheaper, but they sure do have the distribution channels and marketing to sell a whole lot more of them, if the price were to come down (or the quality were to go up). They have the scale to make their nut on volume rather than price. Pretty sure Lund is already using a lot of robotics ... I can't imagine the others aren't. In short, I bet they're wicked interested in expanding their use of robots. Wonder what that will do for them profit-wise, market-share-wise, labor-wise? Everybody that comes in here looking for a boat 22' and under is interested in this question, or should be. Most but not all custom aluminum builders aren't interested in me as a client, and I can't blame you. It costs you nearly as much time and effort to weld up the boat that I want for recreation, as it would cost you to build a boat that someone else will pay a lot more for to earn their living from it. Case in point, Jack Winninghoff has been building his Big Water Duck Boat since '99. It's a hell of a boat. To date he's sold three. First one to a friend (my dad and I helped him spec it out and lay it out) and the third one to a friend who I referred to Winninghoff. In that same span of time, my circle of friends and family have bought eight or maybe nine Lunds in the 20' class. A little more than half the price, a little less than half the boat, and nearly three times the sales volume. There are 1.3M duck hunters in the U.S. There are 12M+ recreational anglers. Only a small fraction of a percentage of us need a 18-22' boat that's not a jonboat. But that little slice of market is enough to make someone a pile of money if they can build and distribute durable boats via a less expensive process than those currently used to support the commercial fishing and guiding industries. Not mass production, not one-off production, but limited production with limited customization. For ever, we've all been looking at the price of aluminum going up and down as our indicator of whether we can afford a welded boat or not. But I think changing production methods will eventually have a bigger impact. It's not a localized market that's convenient for a builder to set up shop on. For example, of all the thousands of duck hunters and anglers in my neck of the woods I probably know by name four or five who would be in the target market. But if you look at it on a larger scale, there's a bunch of us scattered around the states who have graduated up to a 20-22' tin can boat, wished for something better, but backed off when we figured out what the next rung up the ladder is gonna cost. There are just about as many who've graduated, wished for something better, and bought it -- only to be disappointed because they invested $60K in something that doesn't exactly meet their needs, and that has virtually 0 secondary market because the hull designs aren't familiar to most. I've been at the "almost" step twice in the last several years and I'm there again now; that's what prompted my question about landing craft a few weeks ago. Maybe I'll be better served to wait til the robots and declining cost of diesel fuel make the math work out better for me, as well as for whatever builder figures out how to tap into the middle-market between custom and mass produced. A yard like Circa might be the first? We're broadening the topic somewhat to the 'detroit' type aluminum builders, where I was focused on the one-off builder's use of robotics; and that's fine but it is another subject. I think companies like Lund, Starcraft, Gregor (if any are not building anymore- please excuse my lack of state-side awareness) are all manufacturers not boat builders. They (all) use the Henry Ford methods that like widgets and toasters come off an assembly line so robots won't impact their market share- just profits. I was focusing on the technology's potential to allow a skilled workman, whether fitter, layout man, welder or whatever to contribute more to a welded alloy boat in an hour than possible without the robotic tools coming along in development. Lamborghini and Rolls make cars by hand, mainly and they're kind of high cost. Ford makes trucks with robots so they can be sold for less and still have decent profits. I was associating the Pacific or Lee Shore shops with the hand made Italian cars and I'd assign the Lund product group to the Detroit end of the analogy. Mass produced items of any category seem to be more influenced by the others making the same item- Starcraft or Gregor compared to Lund or others in this same niche of boat. But a hand made plate boat could still return a good margin and become lower cost if the benefits of robotics (like CNC cutting ) were applied to the building process that was my heading. Take, for example, one weld process as a way of looking at some of the ideas I hold for this topic. 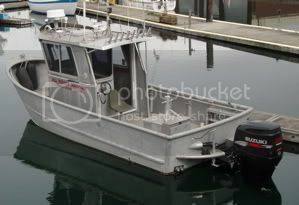 Pacific (I've seen) has TIG welders who apply "jewelery TIG" (some welders refer to precise and uniform TIG in this manner) to the details and even a higher level of MIG than is often seen in welded boats. That requires people with some good skills and are likely to be a bottle neck to turning out twice the number of hulls per year? ( I don't know if this is fact or supposition) What if a robot could be (bought & taught) to do the work of applying these near perfect welds? Well there is a potential to undo a bottle neck allowing Pacific to reduce costs and still maintain profits thereby increasing market share. The final boat's welding is still 'jewelery level' but the number of welders who can do that work is low. I'd estimate that it takes 1 in 100 welders who have "hands" to learn- at least a 500 hours to develop this level of skill. My experience says that not all welders can learn this level of welding skill. BUT... I'm arguing that all robots can learn if they have someone directing the controls who understands how these welds are done. So... a Pacific could be welded without the 'welder bottle-neck' of only one or two people in the entire shop who can do this work. I want the robots to relieve me of old age's shakes and fatigue, I'm not focused on manufacturing, just doing a good job of one design at a time; as I get older and more feeble but just as interested in building good boats. One other feature of robotics that would improve welding is human speed or movement. Just like we all have plasma torches in our shops; they aren't really FULLY useful until they're mounted to a 'robot' or CNC table's carriages so they can go fast enough to realize their real potential. MIG and cold wire feed TIG can both be applied at 'superhuman' speed by robotic systems, that is both types of welding system will weld at rates humans cannot move. So both processes will only become realized in quality including low distortion, smaller scaled welds, low inclusions, use of existing arc control features and other gains; when these power supplies are welding using robotic speeds to apply their welds. But the job shop useful welding robot will probably be the last tool for sale and remain the highest cost as it will have the fewest users compared to the factory floor robot. My luck. I agree with Chaps. Robots are reducing the amount of skilled labor needed. They are coming down the pike fast. I will sound Liberal for a minute but the Middle class is disappearing because of them. Labor Cost go down and less disposable income for the masses. While they are fine tuning the machines you need the skilled labor once it is on line and producing you need just one guy per shift to handle the button pushing. The manual labor of throwing plate does not warrant the $25 to $30 an hour that a good welder makes now. Aircraft Manufacturing is currently undergoing similar progress. China will provide the cheap labor till America Drops the Wage scale to their level. I'm still sticking with one off projects and repairs, It's gotten more interesting now that home base is at an airport. I know this is an old thread but of great interest to me. I had a boat designed, cnc cut, and was astounded at the accuracy of the parts. Talking 20 foot hull plates shaped like a banana, pushed into position along the hull and 1 mm max of error. Granted this was from a fairly renowned Kiwi designer who has a long history of design for cnc fabrication but it piqued my interest. So much so that I built a cutting table with a 6' x 20' capacity, carrying a 5KW spindle. After cleaning up cutting dross from plasma, and noting the stress built into the matl along cuts I knew I wanted to router cut. Interesting experience building the machine, milled my own rails, built the electronics and controls, learned the design and machine software. After the usual teething problems it performed as expected. Awesome. I can cut 5083 and 5086 rapidly, and precisely, using.....a 1/8" bit. Dry. While it's hard to see justifying a GM style welding robot for a small shop, a lower level of this technology is relatively doable. Basically, like downline describes, a combination of hog trough and slide rail, but a computer controlled torch carrier that runs down this adjustable rail. Program your weld sequence, starts stops, reverses, skips etc. and let it eat. Save your program for seam b6, move to b7 on opposite side, and repeat. Once you're dialed in I think you could pretty well count on consistently high quality welds, precise feed speeds, angles etc. kael, sky, the job shop robot won't ever be a robotic cell type as shown in the video. That type of machine is justified by part volume profitability; where tight tolerance repeatability is the key to the investment's return. The fixtures need to be solid and repeatable to a few thousands and that robotic model is not really useful for the job shop boat builder. The type of welding cell shown is for making gazillions of the same thing - and the parts' tolerances are too tight for large scale boat building. A more dynamically adjustable use of robotics will be needed to provide a gain for the one off or even semi-custom builder due to huge (relative term) amount of movement that happens when you weld a >20' LOA hull. but even this is really already a limb on the tree. What is needed is a much faster version of this idea- and that is what will (in not too long) make the robotic welder/machine arm useful to the one-off builder. The head/wire tip/welding attachment of the newer type makes the fine (last few thousandths) adjustments of distance using the IR/'radar' sensor like those now used in some plaz tables for Z. This will allow the software/tool paths to be less exact so the fine adjustments (closer than .1") will come from the feedback of the 'gap sensor'. Also the controller can 'see' or sense the gap by the current flowing and make stick out and gap adjustments to the distance to work. Any digital controller can handle this final motor adjustment- and without that feedback loop- the entire welding 'cell' has to be within tolerances that cost too much to produce for general boat building- boat manufacturing- yes- general or one-off- not happening. Next is the actual 'programming' (which isn't really - more configuration - or tool path "collection of strings" in G-code) and that is where things need to change radically and those changes are in the works. Using a measuring arm- metrology arm- as input- what is needed is to have the hull on a rotisserie, so the welding system can slide along parallel to the keel plane as the boat rolls, and that implies a moving robotic base/carriage- not the fixed to immovable mass shown in the above video of the fixed envelope cell. The welder/builder will walk along the hull and with a voice command/pendant/or smart phone indicate with the flexible measuring arm for input the beginning, end, type of weld and other details. All that will be collected by the controller in a "teach" mode- storing the XYZ locations of all these various welds and then when the 'play button' is pushed the arm will reach into the boat- the boat will be rolled about the central axis, the robot arm base will slide along a path parallel to the hull and the last 1/8" of movement will be 'tuned' by an algorithm monitoring the output current of the welder AND the distance/ht. sensors. Incidentally, all the hardware to do all that I've described is already on the market, nothing new except the interface software allowing the rotisserie, the arms' base carriage and the arm itself to interact as a larger volume work cell. The software ideas are changing too. Formerly and Skypoke will understand this well- every movement, all movements including pauses, tool changes, were all "Go to... x, y, z." or some variation. What will change as the industry wants to reach more and more people is a series of nested logical routines. For example a list of "welds" are just a call to a given subroutine - instead of using a list of G-code go-to statements the processor will feed that particular weld co-ordinates to a weld subroutine that will accept a new X, Y , Z start position and look up the stored (fixed variables for the weld's parameters) variables for that 'name' of weld. Further, instead of getting closer to the work than offset Z, Y, X the confirmation will be done using a tuning algorithm with the distance sensors- then the weld's conditions being met; the system will allow that weld to proceed. As the work (lots and lots of welds) proceeds the boat will move in the fixture greater than the allowable amount of tolerance in the fixed part type of weld cell fixture- the newer robotics will follow the movement and still apply the required weld. Note that many boat welds, especially in the structure elements of the bottom framing are almost uniformly not put into beveled, recessed,m router gouged weld zones- EVEN IF, that is the best weld prep, results in much higher strength for a smaller cross section weld AND... much less resultant built in stress. But the cost to have the parts routed/beveled, prepped are must another cost. However we'll see robotic arms with a weld head, router and wire wheel/oxide removal tool head all working on each weld and moving along the hulls following the patterns set by the builder. Not tomorrow mind you- but 100% of all that I've mentioned is simply the combination of off the shelf hardware combined into a system to serve the work flow of a one off welded aluminum builder. This same system would work for the full production, semi-production builders as well. The bottle neck of 'programming' will go away, eventually (and it could happen with already extant hardware/software combo's) a 3D motion tracker on your finger tip and a few switches could be used to "program" (write the machine tool paths) a robotic welding arm today- IF the control algorithm had the final distance/collision sensing feedback at the head to control (with the welding power supply circuit sensor) to make final 0.001" adjustments for the 'stick out' & gap. This may sound "Buck Rogers"?? if you're not following what's happening in the CAM world? but it'll be here soon. I agree that the human vs robot productivity during handling and tack-up are probably hard to improve due to the huge number and type of tasks? But some of the AI robots now being shown that serve coffee, chat and 'keep company' seem to imply that in the future (not predicting that time frame) all human tasks could be subject to robotic performance? However, if a builder (robot employer) were in higher volume, single-model work instead of the more diverse one-off market- then it looks like the timing will be sooner to see 'shop-robotic-helpers'? Well, these automated processes are pretty specific as to which task they can best perform. Fitup and tacking could well be done as well, using the proper fixtures to hold the parts. But since the real task here is to automate the welding tasks it looks pretty doable from here. Now, what I'm going to suggest isn't state of the art....we won't be using laser scanning to measure and locate,and build 3d models, no lidar for control of distance. But what it is, however, is readily accessed, inexpensive, durable proven tech., well within the grasp of any reasonably competent craftsman. Kevin's outline raised some interesting points, and kind of filled in one of the gaps that I've been pondering. One very nice aspect of this prospect is the fact that carrying a torch is simple and takes very little power or rigidity of structure....compared to my table, which has to be able to accurately hold position against the cutting forces and speed of a 5 hp spindle ripping through wood, plastic, aluminum etc. Big motors, gear reductions, and an extremely rigid structure required for table, not so for this weldbot. Axis 2 is the in-out movement of the torch carrier, perpendicular to X. Let's call this Z. This is torch height. Axis 3 is the rotation of the fixture which holds the tacked together boat. Lets call this Y. This is Kmorin's rotisserie. I don't think it will be necessary to add an additional axis that would change angle of torch though this could be done as well. Height settings can be done on the fly with a simple precision contact that is attached to torch carrier. This contact is set to open or close upon contact with the skin surface. So, in practice this controls the Z axis. This could also be done in a non contact fashion using proximity sensor switches, or can be accomplished using conductivity switches, but the contact switch is simple and precise. So, in practice, you have a long horizontal track that the torch carrier travels down, the length of the boat. On straight runs, only the X and Z axis are in play. As the seam sweeps up along, say, the sheer, the Y axis rotates the rotisserie to keep the seam centered on the torch. Once, again, cheap available tech is in play as there's no need for servos....simple stepper motors with microstepping will drive these three axis. Programming, or learning, as was pointed out is also easy to implement. Now with the flat table, it's possible to reverse engineer 2d shapes by placing them on the table....let's say a carved human face that you want to duplicate. Basically, the machine runs a very fine grid sweep, and instead of a cutting tool it is carrying a potentiometer with a rod and tip that runs across the surface. It maps hundreds of thousands....many...of points, these flow into your CAD program and a model is built. The same technique would work for the individual seams of boat...it will accurately locate both edges of seam, build a model and keep the torch exactly centered on seam when program is run. You can buy this device for 50 bucks....and the plugin to Mach3 is free. So, you've got your seam mapped, now for weld sequence. Easy enough to just insert points for stops starts on your computer screen. Using a synergetic welder....such as the powermig 300, with all the pre flow, post flow, stop and start parameters, stick out auto adjusts, current adjusts on the fly....heck, maybe you could actually use some of this stuff for once, other than work to bypass it which seems to be what most folks do. So there it is, one weldbot built Mad Max style. Software I know and use are Vectric for cad. Mach 3 for machine control. Basically, Vectric takes your design....either drawn by you, or input by material scan, generates g code with a single button push, this drives Mach three which controls machine movement. That'd get you going. A further refinement would be to add one or 2 axis of tilt to the torch head. I don't think it would be necessary, though, as long as it's possible to achieve good welds with torch perpendicular to surface. Using a fixed tilt for torch would work as well, but becomes a problem when you want to run in reverse, or weld a transverse seam which this machine would do as well as longitudinal. Skypoke, a close friend and long time shop owner/welder/fabricator and I were having a similar discussion and it became apparent that he had little or no idea even of the terminology in the discussion let alone did he follow my ideas about how to rig such a weld-bot aide. We're probably off in the weeds for most of our Forum readers because we've spent some time working with NC equipment, including the software to interface the various controls. I suspect that is not uncommon among the typical welded plate-aluminum boat owner who may not have even have a welding system or worked in NC controls or considered the building process manually; let alone digitally controlled for semi-automation? I find the subject most interesting for its potential to allow me to continue to be involved with the precision welding needed to build aluminum boats- even as my carcass if finding quality welding to be more of a challenge. Regarding the software to obtain the kind of results we're discussing; I think Fusion 360 is the 'next step' because of the very high numbers of features that AutoDesk has collected or included under one program's 'scope'. I'm only recently licensed F'360 (less expensive than a phone bill per month) and learning - but I can see modeling, animation, rendering, CAM (3D printing, 5axis milling machining outline, output of 2D outline tool paths, turning, NC shear and press, stamping just to name the NC Manufacturing processes I've briefly explored so far). Just the number of manufacturers' controllers and new CAM machines added in the last couple months is vast. The rate of adding new controllers' G-code particularities (control OS practices, NC machine features not present on another machine) is so high, in fact, that most users have to subscribe to some form of auto-update in order to allow the cloud based app to run the many updates and library expansions at night. I tried to keep up with those tasks manually and simply could not spent enough time. I'm still converting my past 3D modeling practice in Rhino, AutoCAD, Vectorworks, SketchUP, and others to Fusion 360's modeling methods and tools so the CAM outputs are purely spectator sports for me at this level of entry into the application's capabilities. Having a published development package, the number of new specialty apps/add-ins/add-on's large and growing- I haven't even learned to use the package at an agile level yet and I'm having to look at additional tutorial material to keep up with changes that happen with specialty software add in's. I think Fusion 360 is going to be the integrated CAD/CAM environment that many have wanted to use for a long time? As with most software the cost to buy is a small investment compared to the time required to become productive- so converting from other applications to a 'newer' environment is expensive but I think you'll find this worth a look at some uTube vids to get some idea of A'desk's scope of vision for their product?